In the late 19th and early 20th century many of America's ills were attributed to alcohol consumption. 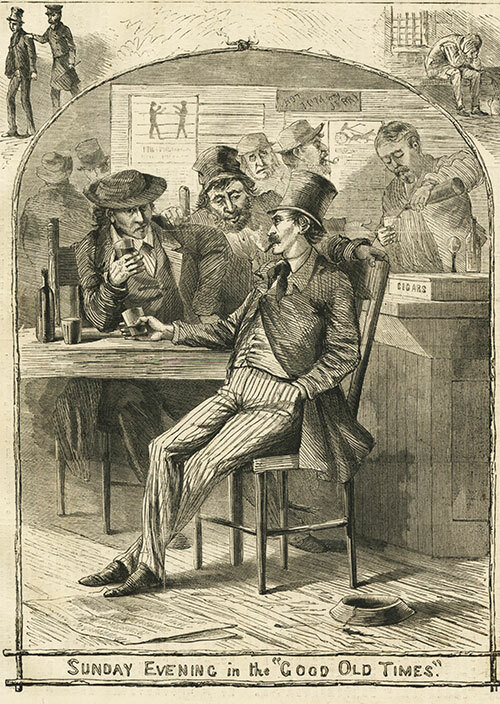 This supposed association between liquor and bad behavior gave rise to the Temperance Movement. There is a lot on the internet and there are several good books (like LAST CALL by Daniel Okrent) that deal with the Temperance Movement. There is no need for me to repeat what others have said far better than I can. My interest in the movement lies in the consequences it had on the reputation of the immigrant population and on their places and methods of recreation. My ancestors, Irish and German, were from ethnic groups known as big drinkers - The Irish with their whisky and poteen and the Germans with their beer and wines. The hard working German emigrant like to spend his day off in the beer gardens. He (and she) worked five and a half days a week and then went with the whole family (children included) to the beer garden on a Sunday afternoon. There they visited with extended family and friends, sang, danced, ate, smoked their pipes (or cigars) and drank beer. I am less sure about where and when the Irish drank. Men surely went to bars to drink. Many "Irish" bars were men only. Some enterprising individuals ran unlicensed grog shops from their homes. 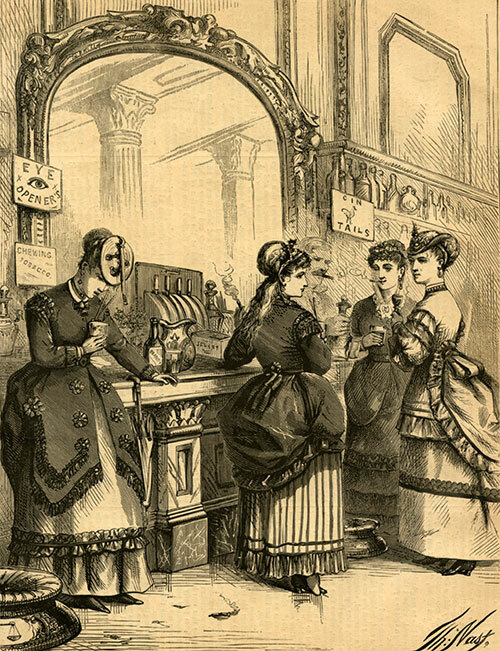 Temperance Movement images do show women in saloons. 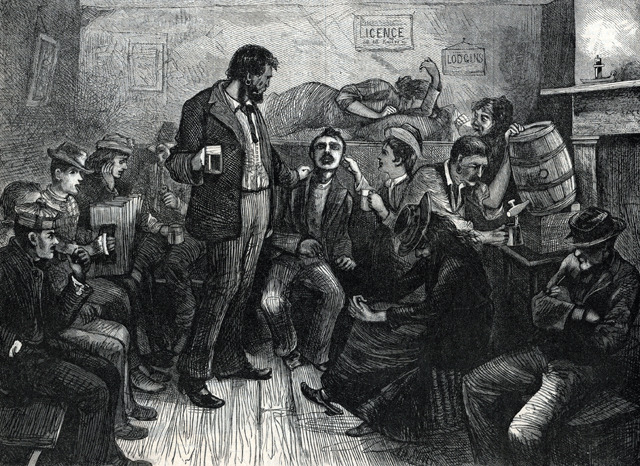 The Irish had a fierce reputations as drinkers - both men and women. And both men and smoked tobacco, usually in the form of pipes. My Irish great grandmother was said to be a pipe smoker and her husband got a tobacco dole from the Irish government when he went back to Ireland in his old age. The inference is that men went to saloons and women went to church, but if my family is any indication, Irish women drank and smoked somewhere. Since apartments were small, there must have been alternative places for social gathering and drinking. 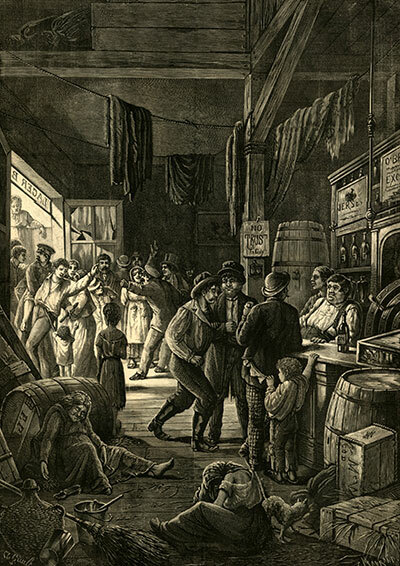 The Irish saloons played an important role not only in socialization but in political life and they often served as job centers. 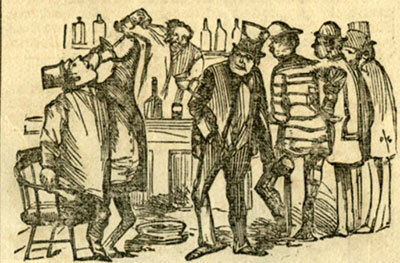 Temperance effort was aimed at closing the German Beer Gardens and the Irish saloons in New York City. A certain amount of that effort contained specifically anti immigrant sentiment. 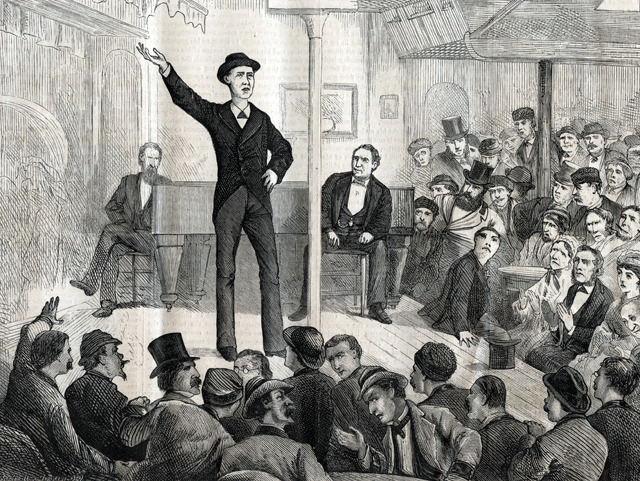 Revivalist preachers were frequently both anti liquor and anti Catholic - often specifically aiming their diatribes at the Irish immigrant and the Catholic Chruch. THE DRUNKARD'S WIFE from an original painting by Thomas Waterman Wood, born Montpelier Vt., Nov 12, 1823. "The lesson given in "The Drunkard's Wife" is a strong one. There are more sides to the painting than one, but all point a moral of deep significance and infinite worth." As the wife points to her drunk husband lying on the ground, the child looks sweetly at the viewer of this sad scene. The bar man is shrugging his shoulders, it is clearly not his fault. What can he do? Notice the poster in the upper left corner of the painting just over the child's head. Bier is the German word for beer. The woman's attire is indicative of an immigrant clothing type. We can infer that the establishment and its clientele were German. Alcohol was said to be the bane of the working class. The Saturday night drunk (having spent his weeks worth of wages on his addiction) the poor wife and children were all part of the message sent by anti liquor and anti immigrant propagandists. Jones. "Do you know, Sir, what I'll do, if the Government persistes in carrying out this exorbitant tax on liquors and cigars? I'll not drink another glass of liquor or smoke another cigar. No, Sir, not one!" One method of reducing alcohol and tobacco combustion was by taxation. That still holds true today. WHICH GETS THE MOST FOR HIS MONEY? 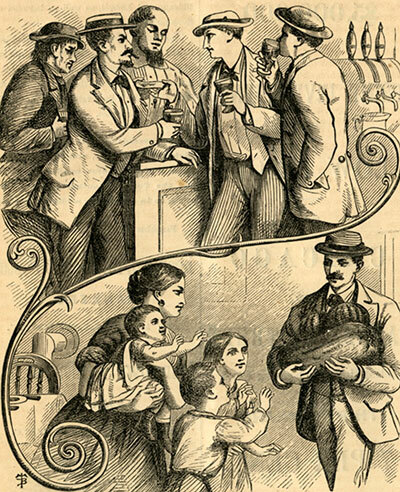 Juxtaposing images of the evils of drinking and the joys of abstinence were common themes in temperance movement journalism. The following two juxtaposed images depict the contrast between the evil, sinning saloon goer and the good living family man. The Good Old Times included drinking, smoking, betting on sporting events and horses racing. It insinuated that a saloon goer would eventually be lead off to jail. In the Good New Times the family goes to church together and spends loving time together with multi-generational interaction. A Hot Tom and Jerry is a kind of eggnog with rum or brandy. The dog bowl like item on the floor must be a spittoon. The dandyish dress of the two main characters may also insinuate some form of bad behavior. I believe that the sketch in the upper left corner shows repentance of the husband's previous bad behavior. He is now a good and responsible citizen - a loving husband, son and father. "The picture we give is not the least powerful argument which has been advanced in favor of the Excise law and of temperance. It tells its own story, and any attempt at pointing its moral in words would only weaken the effect of the engraving. No matter how little good the Excise law may have otherwise produced, certain it is that it brings such peaceful Sabbaths as New York had seldom before enjoyed; and that happy result is enough to justify its strict enforcement in the metropolis." 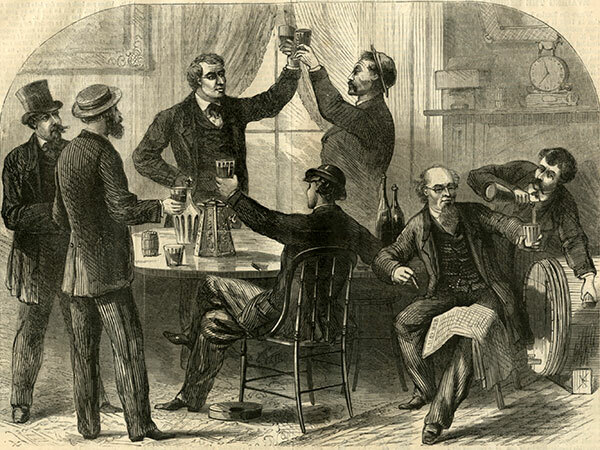 Among other things the New York Excise law of 1866 prohibited the sale of liquor on Sundays. Rather than reducing the consumption of booze, sales remained more or less the same with people stocking up on Saturday night. Many people took the ferries to Jersey City, Hoboken, and Union City where the beer gardens were open on Sunday. 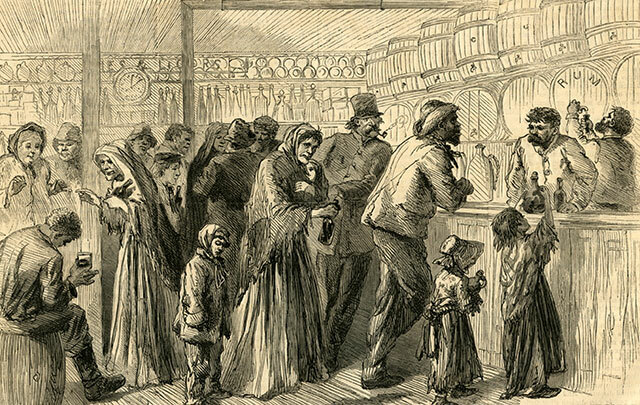 "On Saturday night the rum shops of the city are crowed with men, women and children who have come there to purchase liquor for use on Sunday, when the shops will be closed. Nowhere, and at no time, will a person behold more squalor, degradation, and misery than in a New York rum-shop on any Saturday evening." In the lower portion of this Puck cartoon of 1884 a man is lying ill in his squalid apartment. His wife holds a pale sleeping child in her lap while another child sleeps against her knee. Yet a third child is tiptoed on a chair trying to look out of the lone window in the apartment. 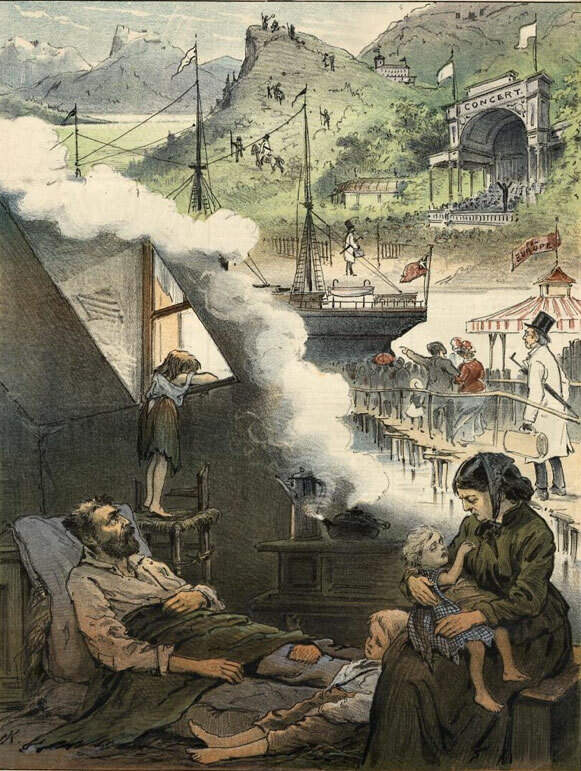 On the top portion the clergyman in his tan coat and top hat, is shown in three scenes: boarding a boat, listening to an our door concert in the countryside and riding a horse to the top of a hill overlooking a river. 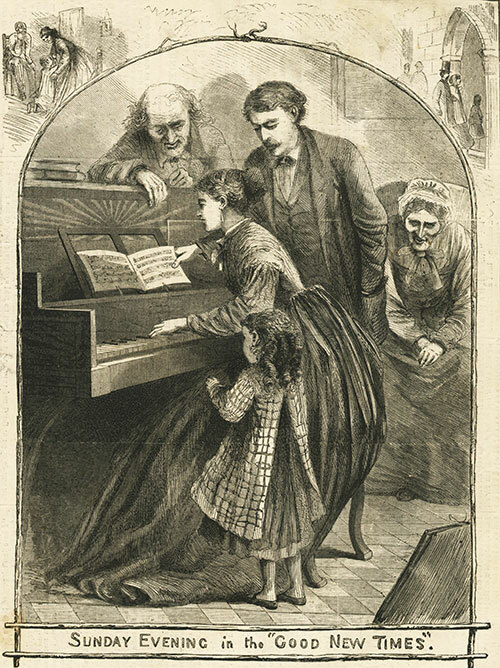 The caption reads: A PICTURE FOR THE FOES OF SUNDAY CONCERTS. THE CLERGYMAN'S LEISURE AND THE POOR MAN'S HOLIDAY. 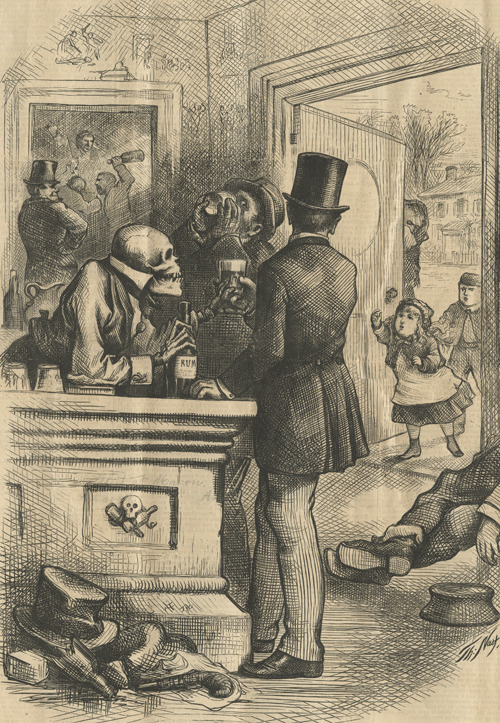 In this drawing by Thomas Nast, a well dressed patron stands at the bar surrounded by symbols of the evils of drink: the skeleton bar tender dispensing evil rum, the decoration of the skeleton with crossed bottle at the end of the bar (a Skull and Crossed Bones being the symbol of poison), the drunk lying on the floor, the fight in the background, the graffiti on the wall (showing among other things another fight), and the crumpled clothes, broken bottle and gun lying on the floor. A favorite image of the anti liquor movement was of the sweet child beseeching a drunken parent (usually a father) to leave (or to not go into a bar). In this case there are two children and a possible black shrouded wife. Another theme was a parent corrupting the morals of their child with the wickedness of drink and its associated evils like smoking and gambling. 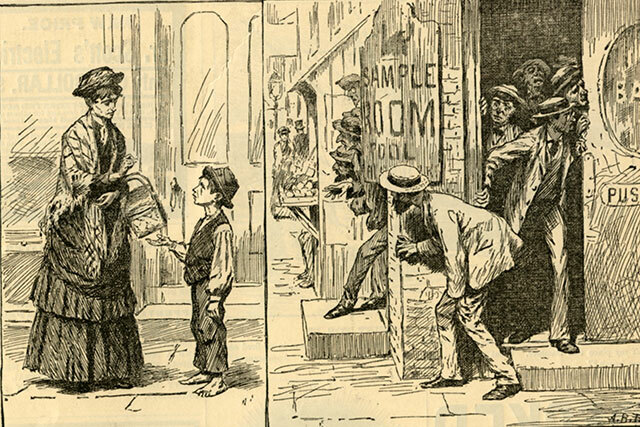 Lady (offering urchin a penny) "Now go into that saloon on the corner, and tell the man you will see in there in the gray suit and straw hat that if he don't come out of that right away his wife will come and fetch him!" Her dress and her grammer insinuate that this woman is of the "lower" class. The street "urchin" is a unsupervised child of the slums who spends most of his/her time on the streets. Street urchins were another "cause" of social reformers. See Children in New York City's Lower East Side . There were certainly issues for the children of the "slums". However, on occasion reformers took things to too far resulting in catastrophes like the Orphan Trains which often sent innocent, non-orphaned, city children to a life as oppressed farm laborers in the West. "The temperance movement in New York was begun on Sunday evening, March 1 at HARRY HILL'S Variety Hall, in Houston Street." The gathering, despite the fact that it was held in a saloon, was called as a prayer meeting. "The gathering was orderly, no drinking was allowed, and no profane or indecent conversation was heard." The ladies who were expected to lead the prayers did not show up and several gentlemen stepped forward and spoke on the evils of intemperance. A "working-man" addresses the audience while Harry Hall the owner of the salon is seated "a little to the right, and in the rear of the speaker." Harry Hill's located at 26 E. Houston between Crosby and Mulberry streets was a notorious saloon with a "bad" reputation. Harry Hill died in August 1896. His obit in the New York Times says he was born in Epsom, England and was fond of betting on the horses. He immigrated to the US in the early 1850s. He was a "sporting man", a good wrestler and "very handy with his fists". His establishment was the "resort of sporting and betting men, and of the most desperate and criminal persons of the city". Backwards in the doorway on the top left = "LAGER"
Temperance leaders were trying to prohibit drinking on Sundays. 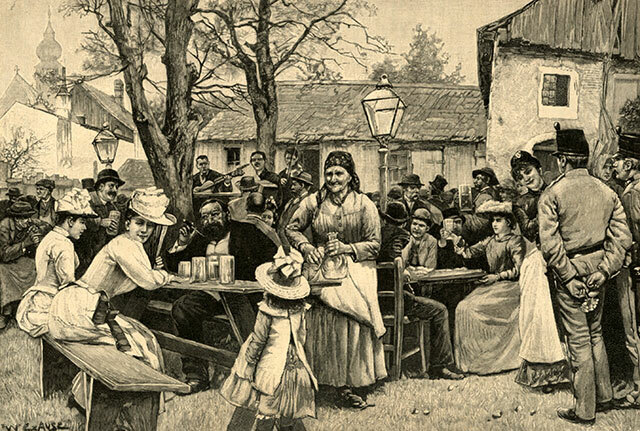 The German American population liked their Sunday afternoons in the German Beer Gardens, drinking and singing with their families. The German Beer Gardens took to calling these Sunday afternoons "Sunday Concerts" or "Sacred Concerts". 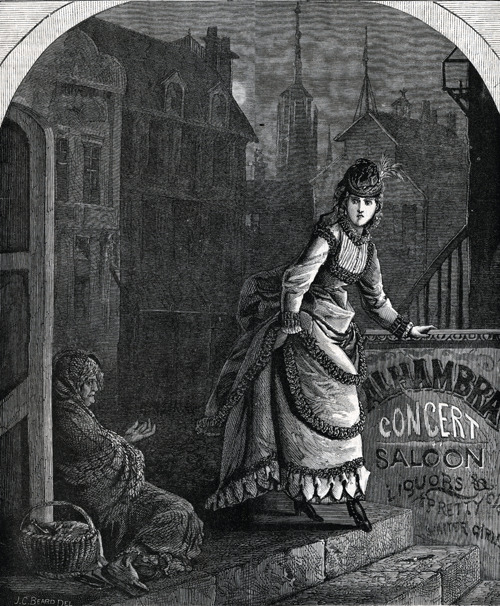 This illustration alludes to the dangers lurking to a young woman who might spend her afternoon in the Beer Gardens and then end up a destitute beggar on the street with her bottle tucked in her basket. The Alhambra Saloon was at 14th Street opposite Tammany Hall. Charles Faas, 226 and 228 West One Hundred and Twenty-fifth street. James McGarann, 2378 Third avenue. New York Maennerchor, 203 and 207 East Fifty-sixth street. Ella Petersen, 284 Eighth avenue. William Weiskopf, One Hundred and Forty-eighth street and Bergen avenue. Emil Schwab, 208 East Houston street. Louis Gross, 14 Stanton street. William O’Brien, Madison Square Garden. Ernest Friede, 185 Chrystie street. George J. Kraus, Volks Garden, 231 and 233 Bowery. Charles Krumm, 167 Chrystie street. Max Gombossy, 152 Stanton street. H. C. Miner, 167 and 169 Bowery. Samuel R. Howard, Jr., 2378 Third avenue. F. Steen, 60 Stanton street. George W. Sauer, Atlantic Casino, One Hundred and Fifty-fifth street and Eighth avenue. Henry Schork, 5 Battery place. Emil Schwab, 208 Houston street. Alfred Reichelt, New York Amusement Company, 115 West Twentythird street. Thomas Conway, 312 Eighth avenue. New York Mrennerchor, 203 and 207 East Fifty-sixth street. William Schwab, 2387 Third avenue. Charles L. Kessel, One Hundred and Fifty-fifth street, west of Eighth avenue. George J. Kraus, 231 and 283 Bowery. Adolph Herrmann, 290 Eighth avenue. Jacob Rebzer, 460 East Fifty-seventh street. Jacob Blank, 134 and 136 East Thirteenth street. Jacob Hirsch, 114 East Thirteenth street. Ernest A. Jurgens, 55 West Twenty-third street. Adam Gander, 139 Eighth street. Frederick Steen, 60 Stanton street. George J. Kraus, 23l and 233 Bowery. 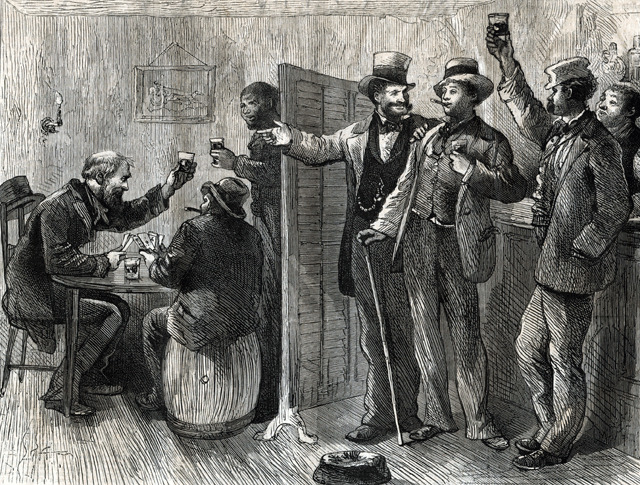 The next two images show two reactions to the Excise Law of 1866 which closed bars on Sunday. One group chose to ignore the law and continue to meet and drink in private places. Others locked up the bar and did not serve drinks, but the customers showed up anyway and sat around cursing the Police and the Commissioners. The sign says "NO Liquor Sold Today". The clock in the top picture reads 11:35. The clock in the lower picture reads 12:15. There are spittoons in both images. Even the dog looks annoyed. POLICE CAPTAIN: (time, Saturday night 11:59) "Now boys, your disguises are perfect, and I expect you to make a large haul of saloon-keepers before morning — the Excise Law must and shall be enforced! 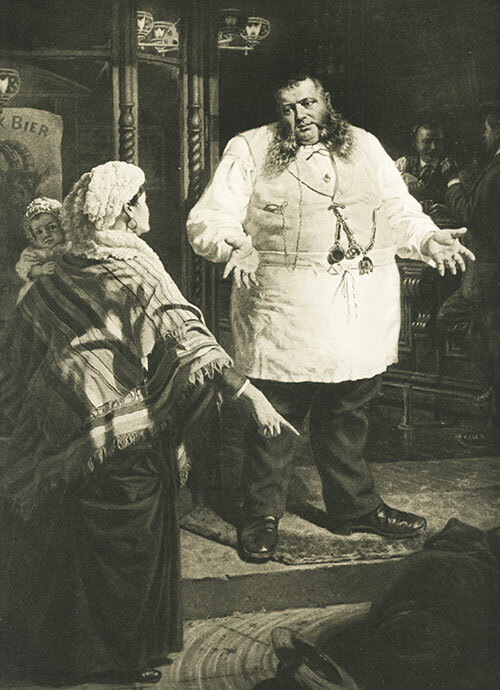 The sign on the wall reads" Notice Enforcement Excise Law"
The name of the carpet bag held by the man in the white coat says "J. Bassett Squeedunk"
The man in the background in front of the mirror is painting his nose with something from the jar, marked "red" that is on the shelf. 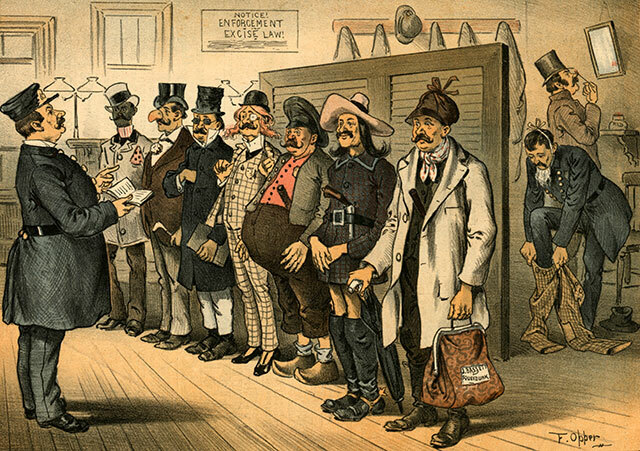 This cartoon depicts some stereotypes: The man in black face at the end, the man next to him with the false beak nose certainly represents a Jew, I don't know about the next one (an intellectual? - he is carrying a book and wearing glasses), the dandy dresser with the red hair must be Irish, the man with the big belly and wooden shoes probably represents a German, the next character with the boots and spurs may be a cowboy (is that a cowboy hat? ), Squeedunk is from a small town or a yokel. The Excise Law was perhaps the most violated law ever passed. By contrast, this European image depicts a Heuriger, a tavern which served only wine and cold food for 2 or 3 weeks when the new white wine was ready. This group includes all social classes, the young and the old, families and single people, military and civilian, in other words, the entire population of the village enjoying an ancient custom. The temperance movement insinuated that women who went to bars were drunkards - and possible prostitutes. 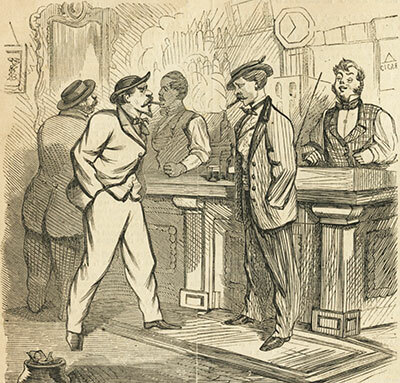 While many of the images on this page show all-male bars other do show women in bars. Albeit the women in these images look completely degenerate. 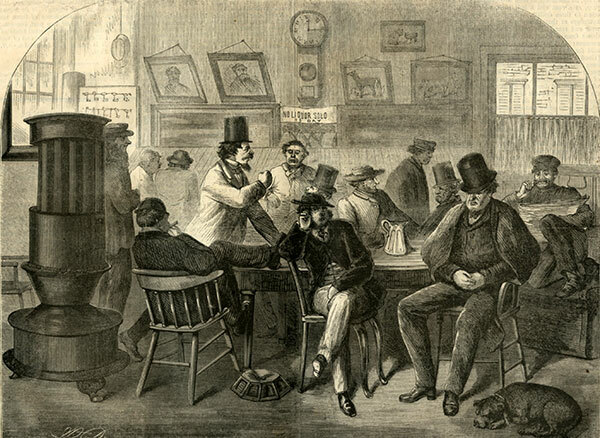 There were certain bars such as the celebrated McSorley's Ale House which did not allow women. However, as the images on this page show there was no law against women in bars. It appears to have been a class and cultural thing. "Lower" class women and immigrants appear to have had a totally different take on the situation. Some obviously took the position that it was "common", dangerous, or beneath them- Like the lady who would send the "urchin" into the bar to chase her husband out. Others, like most German women, went with their families to socialize at the "Beer Gardens". See Beer Halls. I am assuming there was an Irish equivalent of a family bar, but I have not found any images. Not only did immigrant women go to bars but several women in Red Hook Brooklyn's German American and Irish American communities ran saloons. Anna Depperman, age 25, a widow, was listed in the 1880 census as a "saloon keeper". Elizabeth Bell ran a restaurant/boarding house that sold liquor. Ellen Kassenbrock, the Irish born widow of the German Christopher Kassenbrock, ran the family"grocery" business after the death of her husband, if not before. The grocery sold liquor. Margaret Murray took over the family saloon after the death of her husband. Ann O'Brien Costello ran a saloon after the death of her husband and son. Kunnigunda Siebe also ran a saloon after the death of her husband. The male counterpart of the above image entitled "ALL RIGHT"
As with many of these images I buy online the accompanying text is missing. 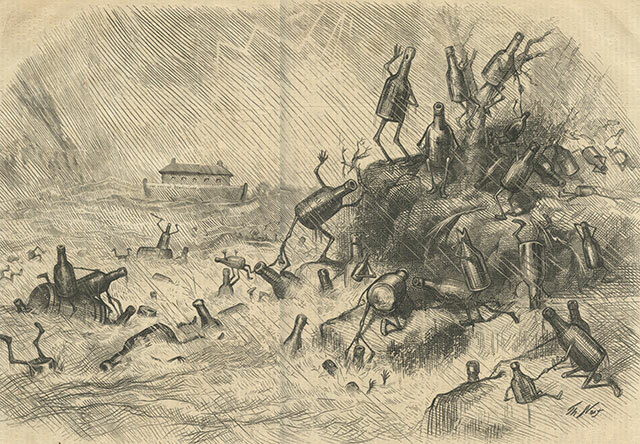 I would love to know the 1869 interpretation of this print. 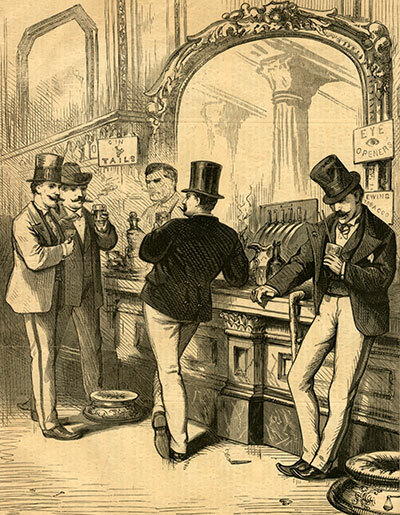 This two part image of a rather high class saloon with ornate mirrors and marble bar depicts eight customers at the bar. On one side are four men - one who appears inebriated. On the other side are four women - one who appears inebriated. The stance and grouping of the four men and the four women are identical. The signs on the walls indicate that gin cocktail, eye openers (the first drink of the day) and chewing tobacco are for sale. On the bar are "segars" and brandy. On the floor are spittoons and lit cigars. Cigarettes, which are currently the most common form of tobacco consumption, did not become popular until the late 1800s. Prior to that tobacco was consumed in the form of cigars, chewing tobacco, pipes and snuff. Both the men and women are well dressed in the fashions of the day and as such indicate members of the "upper" class not the "lower" class. The bartender and four of the patrons are smoking - INCLUDING TWO OF THE WOMEN! The women are not dressed provocatively, so I assume they are not meant to indicate prostitutes. A big question in my mind is why are the men and women not drinking together? 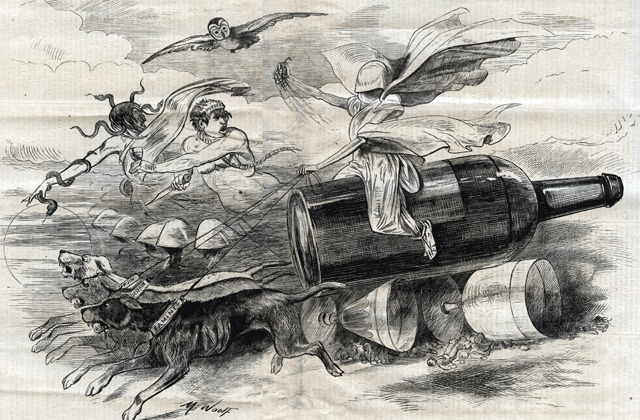 Thomas Nast was a known supporter of the Women's Temperance movement. Nast was anti slavery, anti Catholic, anti Irish and anti alcohol. On the ark ""THE ARCH OF TEMPERANCE"
But legions to the bottom sink.